You’re a new manager and I’m going to allow you a couple of minutes to feel sorry for yourself. Let’s get it out there. 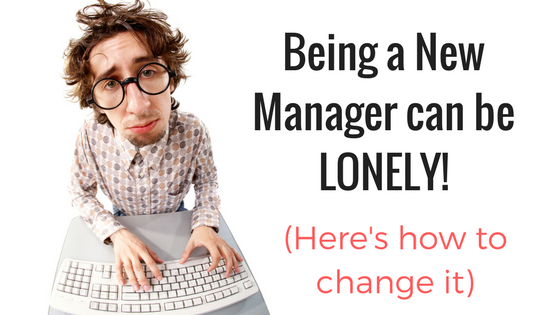 Being a new manager can be lonely, can’t it? I bet you thought about a lot of things when you got promoted. The new responsibilities, managing a team, making decisions. You weren’t going to make the mistakes your managers have made. You envisioned this close knit team all working together with determination and humour. And then you find that your new manager duties aren’t as simple as you thought they’d be. You start to understand why previous bosses made the mistakes they did. Suddenly you find yourself a little lost. It’s then you notice the change in dynamics between you and the people that used to be your team mates. These were the guys you would sound off to over coffee, vent your frustrations. But now? Well, somehow that doesn’t feel right. How can you share your concerns, your fears, the doubt you have in your decisions. You’re their boss now and you feel you should have all the answers. You feel you need to justify the promotion you have just received. The dynamic change – creating that line between you and your team – seems instantaneous. Yet the acceptance amongst your new set of peers is not as quick. It feels like you’re on your own, dealing with one of the biggest transitions in your career without a trusted support network. OK, enough of the doom and gloom. Let’s sort this out. Step 1: Believe you ARE good enough. The feeling you’re not accepted amongst your new peers could well be of your own making. When you’re feeling out of your depth, it’s hard to believe you have a rightful place in this group of experienced managers. You are good enough to be there. But you have a lot to learn. Your peers know that and will appreciate it if you recognise it too. Drop the bravado that you know it all. It is time to find humility, be bold and seek their advice. And then shut up and listen. You probably have a ‘to do’ list like you never imagined. And all of the tasks feel like a big challenge and of the highest priority. But you need to add this to your list, and it should be one of the first ones you tackle. Tim Ferris, a man of many wise words, says that if you have a list of challenges ahead of you, work first on the one that will make the others easier or irrelevant. And having a great network around you will make things easier. You will learn so much faster. Set up a meeting with each of your new peers. And learn about them. Ask them questions. Listen to their thoughts. People love to talk about themselves and their ideas. Ask how they think your team and theirs can work best together. The key is about humility. You are worthy of being in their arena. Heck, you may be a better manager than them one day. But now is the time to learn from them. Maintain these relationships. Make time to grab a coffee with them. Don’t just talk to them when you need something. Think about how you can help them and be the one that adds value. Yes, I know you’re crazy busy with your own stuff. But trust me, you need to show you are willing to give as well as take. Nurture these relationships and when you do need help, it will be forthcoming. You will make mistakes in your new role (expect it and be ready to learn from them). These relationships could stop the fall out from mistakes be as catastrophic as you fear. Oh and you know that person in your new peer group that is a bit dismissive. The one you feel most nervous around? Don’t stress about them. They nearly always come round. A great way to turn that relationship is to ask them for quick bits of advice. Nothing that will take too much time but flatter their ego and tap into their expertise. Again humility is key here. Oh and caffeinated beverages also work. Grab them a double mocha cappuccino next time you are picking one up for yourself in Starbucks. Then from the relationships you make, think about whether any of these could be your informal mentor. Having someone you can trust to share concerns with and sound out ideas is incredibly beneficial. You don’t have to ask the question ‘Will you be my mentor?’ (I always feel that is like asking if someone will be your best friend). Start with asking some advice or sound out an idea with them and take it slowly from there. And don’t forget to find opportunities to give back too. Being a new manager can be lonely. But you’re not alone. There are loads of people finding their feet in their new role as a manager. Speak to your HR team and see if you can connect with some other new managers in the organisation. Or come and join our free facebook group for new managers. The New Manager Network is a safe place where you can ask questions, get feedback on ideas and let off steam in a community of people that get what you’re going through. Your relationship with them will be different than it was, but it does have potential to be even better. Just remember that if you treat them well, they will support you every step of the way. It's like having your very own cheerleader in your inbox once a week. Welcome New Manager! You're first email will be with you shortly!